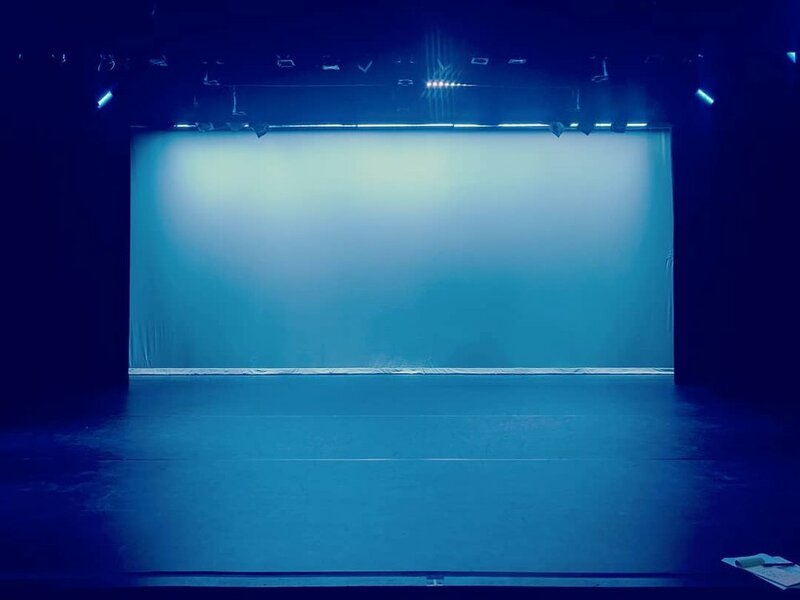 Our stage is a traditional proscenium with an apron extension and false proscenium legs. 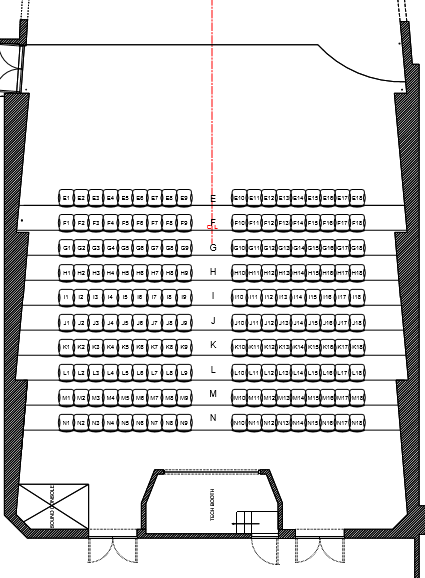 There are 2 exits located downstage of the curtain line; one stage left and one stage right. Our stage is fully accessible. DS Apron Edge to Plaster Line Depth: 8'-0"
Down Stage Apron Edge to Cyc Depth: 32'-0"
Stage Height: 2' -1 1/4"
SL Curve Floor Width: 9'-9"
SR Floor Depth from Last Seat to edge of stage: 18'-6"
SL Floor Depth from Last Seat to edge of stage: 14'-4"
US Floor Width from SR to SL curve: 33'-8"
DS Floor Width from Last Chair SR to Last Chair SL: 43'-3"
The stage floor has a black Masonite top and a Homeostat layer underneath. 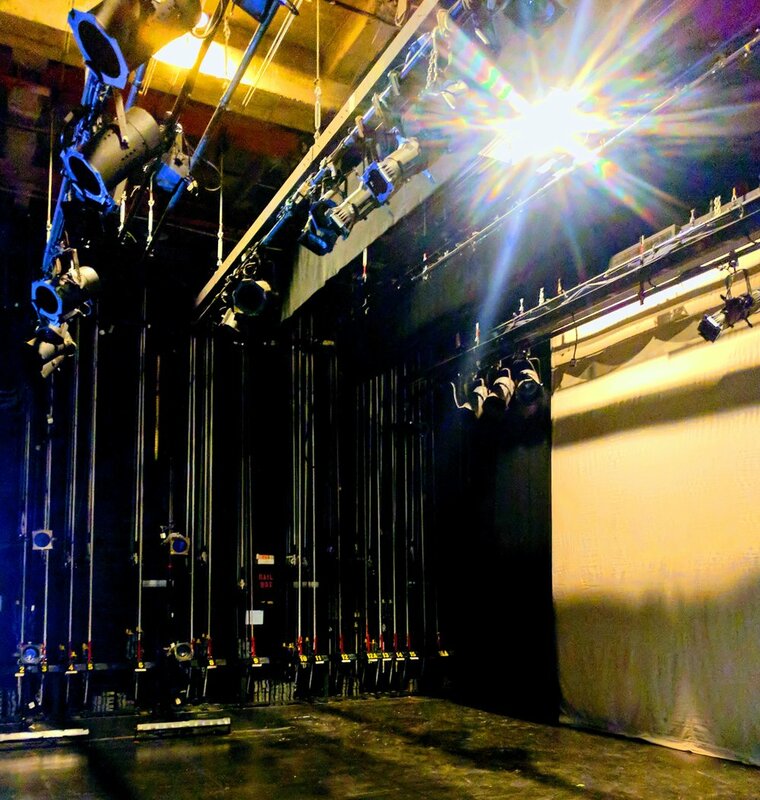 The practical maximum depth of the stage (from downstage edge to the cyclorama) is 32 feet. We have black Harlequin Cascade Marley that can be laid down. There is a charge for removal and restore. There are a total of 250 seats, 180 are raked seats and 70 seats are free standing on the house floor. The lighting booth is located at the back of the house on center line with a full view of the stage. The booth comes equipped with stage manager monitors, glass windows that may be opened upon request. Our house is fully accessible. 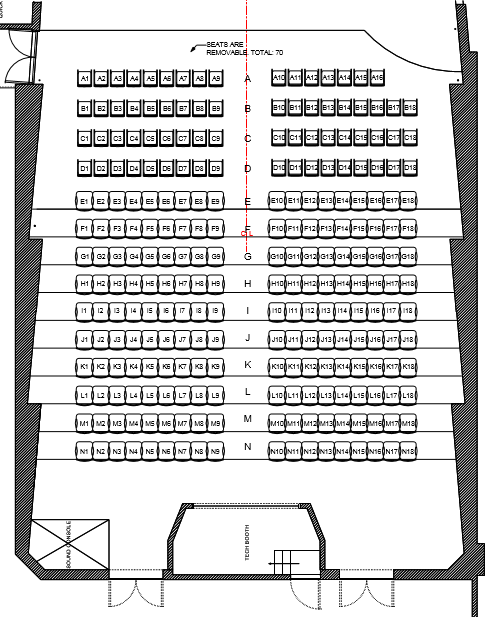 We have two large dressing rooms both located stage left. Each one accommodates 10-15 people; both are equipped with toilets, hot and cold sinks, and lit make-up mirrors. Both come equipped with video and audio monitors of the stage. There is also an ironing board, and iron and a steamer in each dressing room. A call board is located between the two dressing rooms and a green room is located down the hall. The dressing rooms are the wings are fully accessible.